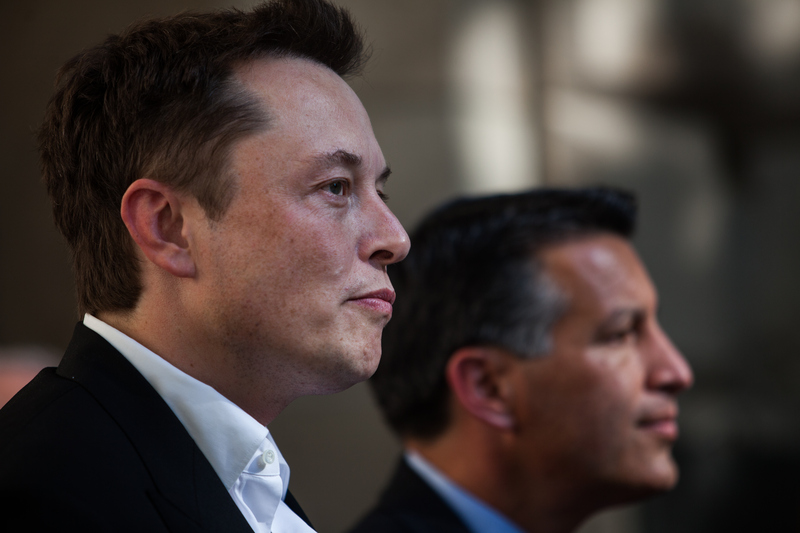 Visionary SpaceX and Tesla Motors founder Elon Musk is a lot of things. He's a brainiac who coded and sold his first video game at the age of 12, the co-creator of the global payments system PayPal, a father of five, and a billionaire philanthropist with a certain fondness for luxury sports cars (Iron Man director Jon Favreau even admitted to the Los Angeles Times in 2012 that lead Robert Downey Jr. had modeled his own version of engineering prodigy slash superhero Tony Stark after Musk himself). But of all the tidbits and anecdotes floating around the internet, there's just one Elon Musk fact that you need to know to truly appreciate his eccentric genius: He's a dreamer. According to Bloomberg Businessweek columnist Ashlee Vance, whose book Elon Musk: Tesla, SpaceX, and the Quest for a Fantastic Future debuted earlier this year, Musk keeps two large posters above the desk in his cubicle at the SpaceX offices in Hawthorne, California: On one side is an image of the planet Mars, and on the other, an imagined rendering of what the planet might someday look like, after he and his colleagues have colonized the Red Planet. That might sound a little strange to outsiders, but for Musk, that dream is what's kept him reaching higher and higher with each new technological vision. I really think there's a fundamental difference, if you sort of look into the future, between a humanity that is a space-faring civilization, that's out there exploring the stars, on multiple planets, and I think that's really exciting, compared with one where we are forever confined to Earth until some eventual extinction event. He wasn't exactly wrong either. As kindly as the Earth has treated its inhabitants over the past 4.5 billion years (relatively speaking... sorry, dinosaurs), its resources are finite. And even though it will likely take several billion years for us to finally reach a point where we've abused our ecosystem to the point of no return, there's really no harm in having a back-up plan. But Musk wasn't done yet. In April this year, displeased with the fact that were no serious plans for a manned mission to Mars on NASA's radar, the enigmatic inventor told astrophysicist Neil deGrasse Tyson that he and his SpaceX team were planning on debuting their own outline for a Mars colonizing spaceship within the year. "I went on the NASA website and I couldn't find a date for a manned Mars mission," he said in an interview on Tyson's Star Talk Radio program. "I think we’ve got a decent shot of sending a person to Mars in about 11 or 12 years." He added that there was "plenty of will" and support among the public, but that they needed someone to show them a cost-efficient model that wouldn't force the government to sacrifice vital programs like healthcare in order to fund it. It's a big dream, but not so far out of reach, the way Musk sees it. In an interview with Wired magazine in 2007, Musk stated that his end-goal would be to create a reusable rocket system (which his company is currently developing) that would ferry humans back and forth from Earth to Mars. The future of our existence, he claimed, counted on it. "The ultimate objective is to make humanity a multiplanet species," he said, elaborating that, 30 years from now, there would be a "base on the moon" as well, where travelers to the Red Planet could stop along the way. As Slate's Phil Plait put it, quoting the late Soviet rocket scientist Konstantin Tsiolkovsky in an interview with Musk this past April, "The Earth is the cradle of humanity, but one cannot live in the cradle forever." With an unapologetic daydreamer like Musk at the helm of future Mars colonization efforts, humanity will be crawling its way to the future in no time.